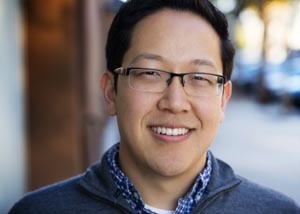 PALO ALTO, Calif. — Award-winning Bay Area playwright and composer Min Kahng thought his discovery several years ago was “fascinating” and “unique.” It would be “fun and interesting” to adapt for the stage, he further believed. His adaptation of one of the first-ever graphic novels has opened for its world premiere on Palo Alto, Calif.’s Lucie Stern Theatre’s stage, a production of TheatreWorks Silicon Valley running through Aug. 6. Honors from the first round of the 2017 Edgerton Foundation New Play Awards were presented to, among other works, Kahng’s musical. The Four Immigrants: An American Musical Manga had received four public readings. “In general, people seem very excited by this story,” the 35-year-old Kahng said. The adapter began writing his stage version in 2014 at TheatreWorks’ Writers’ Retreat. There, he worked closely with the graphic novel’s translator, Frederik L. Schodt. The son of Korean parents said those who can relate to the immigrant experience have responded positively to his adaptation. He recalled a Turkish/American good friend who told Kahng he can identify with the characters. Besides, immigration is “at the forefront” of issues on people’s minds these days – demonstrating that about 100 years after the story takes place, the world is still grappling with such issues, the playwright/composer said. 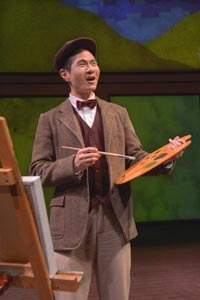 Kahng said he is happy with his stage adaptation of “The Four Immigrants: An American Musical Manga.” Manga are comics created in Japan or by artists in Japanese, adhering to a style created in Japan during the late 19th century. “I am very excited and proud,” the playwright and composer said. He credited an “amazing team,” of behind-the-scenes theater artists and actors. He said his first challenge was to determine the style in which he’d write and compose the show. The question he faced: How do you turn a 20th Century comic book into a musical? He settled on a vaudevillian style after he noticed parallels between the comic book industry and vaudeville. During an earlier stage of development, the show was more pointedly vaudevillian through the use of an MC character. However, Kahng said he discovered that the story was strong enough that it didn’t require such a framing device. The musical is still vaudevillian, “but less so,” the playwright/composer said. He said the fact that he’s the son of Korean immigrants also helped him relate to the story. The graphic novel, Manga Yonin Shosei, was translated as “The Four Immigrants Manga: A Japanese Experience in San Francisco 1904-1924 by Frederik L. Schodt. 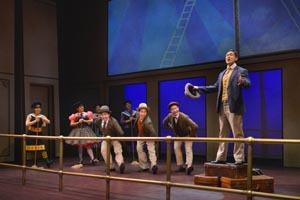 The musical encompasses several musical styles, including ragtime. It is characterized by a syncopated melodic line and regularly accented accompaniment. Black American musicians began developing it in the 1890s. Musicians play ragtime music especially on the piano. Audiences will also hear styles such as western and country. The creative process involved mapping out the adaptation and determining where he should insert songs, based on the emotions of a given moment. One factor that convinced him of the graphic novel’s musical capability was the story arc of the four immigrant friends. Although each has a different goal and “have very different experiences of America, they remain friends throughout their journey.” Kahng added he wanted to focus on the foursome’s steadfast friendship, even through the hardships they experience. He has read the graphic novel more times than he can count. “I think the word I always use is ‘fascinating,’” he said about his reaction each time. It’s a historical tale, possibly blending fact and fiction with many layers. However, Kahng said it’s hard to ascertain the intentions and motivations of the source material’s author. He hadn’t written or said anything to answer that question. During a telephone interview before previews began, Kahng said he was happy with the cast and crew’s work. Production director Leslie Martinson said Kahng has been “an amazingly generous collaborator” throughout the rehearsal process. Kiyama didn’t include himself in many of the original cartoons. 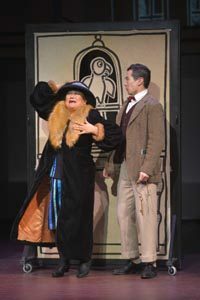 The director said she and the other technical artists have enjoyed using “cartoon logic” in staging the musical; for instance, to move ahead in time. Preview audiences responded positively to “both the goofy humor and the moving story of the friendship built between these young Japanese men growing up in San Francisco in the 1910s and 1920s,” the director said. Kahng, of course, grew up in the Bay Area during a much later time. He said from the time he was young, he always created stories. A very early reminder of this is a recording of him creating a radio show at age 6. He recalled always wanting to tell stories and being drawn to, for example, Disney films and musicals. His parents, who weren’t interested in the arts, ran small businesses. They preferred more financially stable lines of work for their son, he said. But that didn’t stop him. He “hung out” with “theater kids” in high school and wrote skits and plays throughout college. He entered college undeclared as far as a major, but eventually settled on music. The respected writer credited his knack for storytelling and the chances people took on him with helping him reach this point in his career. American Theatre magazine featured him as one of the “9 Musical Theatre Writers You Should Know.” He’s also received the Theatre Bay Area Titan Award for Playwrights and is a resident playwright with Playwrights Foundation. 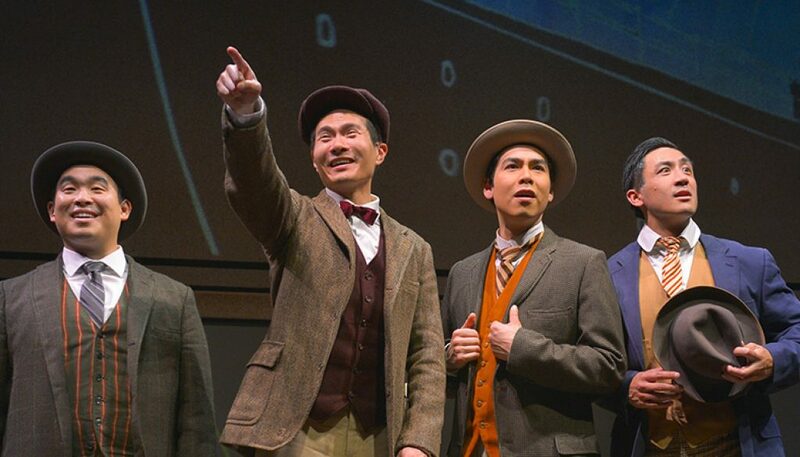 The Four Immigrants: An American Musical Manga continues at the Lucie Stern Theatre, 1305 Middlefield Road, Palo Alto, through Aug. 6. Ticket prices range from $40-$100, with savings available for educators, seniors and patrons 35 and younger. Pricing is subject to change. Performance times are 7:30 p.m. Tuesdays, 2 p.m. and 7:30 p.m. Wednesdays, 8 p.m. Thursdays and Fridays, 2 and 8 p.m. Saturdays and 2 and 7 p.m. Sundays. For information or to order tickets, visit theatreworks.org or call (650) 463-1960.